The Cobblers have strengthened their squad with the signing of Preston North End left-back David Buchanan. The 29-year-old was this week released by the Lilywhites following their promotion to the Sky Bet Championship, and Town boss Chris Wilder has moved quickly to make his third signing of the summer, following on from the captures of Alfie Potter and Nicky Adams. A former Bury, Hamilton and Tranmere Rovers player, Buchanan was a regular in the Preston first team last season until the turn of the year. 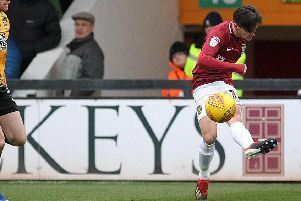 An injury in January meant he was sidelined, and he was unable to force his way back into the team as Simon Grayson’s men just missed out on automatic promotion from league one, before going up via the play-offs with a stunning 4-0 final success against Swindon Town on Sunday. Buchanan was born in Rochdale, but represented Northern Ireland at under-19 and under-21 level, winning 15 caps at the latter age group. He was youth trainee at Bolton Wanderers. before signing for Bury where he spent six years. For the final three of those six years he was managed by current Cobblers assistant Alan Knill, with Town manager Chris Wilder also assistant to Knill at Gigg Lane for the 2008-09 season. After leaving Bury he spent a year in Scotland at Hamilton Academical, before a season-long stint at Tranmere, before his 2012 switch to Preston. In total, Buchanan has made 342 senior starts, plus 36 as a substitute, and scored two goals.